Bill Hardy was born in 1932 in Winterville, North Carolina. He was commissioned a 2nd Lt through the Army ROTC program at North Carolina Agricultural and Technical State University on May 31, 1954, and went on active duty beginning July 18, 1954. After completing Infantry School, Airborne School, and Ranger School, Lt Hardy served with the 325th Airborne Infantry Regiment of the 82nd Airborne Division at Fort Bragg, North Carolina, from January 1955 to April 1957. He then completed advanced training at the Army Infantry School before serving with the 19th Infantry Regiment and 8th Cavalry Regiment in South Korea from August 1957 to October 1958. His next assignment was as a training officer and company commander with the U.S. Army Training Center at Fort Jackson, South Carolina, from December 1958 to May 1960, followed by advanced infantry training from May to November 1960. Capt Hardy served in West Germany from November 1960 to October 1963, and then served as an instructor with the U.S. Army Security Agency Training Center and School at Fort Devens, Massachusetts, from November 1963 to October 1965. His next assignment was with the U.S. Logistics Group in Turkey from October 1965 to August 1966, followed by additional training from October 1966 to February 1967. Capt Hardy then deployed to Southeast Asia, where he served with U.S. Military Assistance Command Vietnam from February 1967 until he was captured and taken as a Prisoner of War on June 29, 1967. After spending 2,055 days in captivity, Maj Hardy was released during Operation Homecoming on February 12, 1973. He was briefly hospitalized to recover from his injuries, and then attended Command and General Staff School from August 1973 to June 1974. 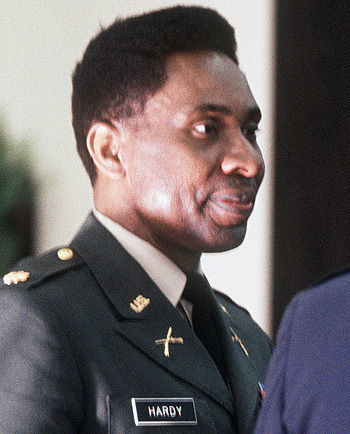 Col Hardy next attended graduate school at North Carolina A&T from August 1974 to August 1975, and then completed Psychological Warfare training before serving as a Psychological Warfare Officer with the 6th Psychological Operations Battalion at Fort Bragg, North Carolina, from December 1975 to June 1976. His final assignment was as Assistant G-5 with Headquarters XVIII Airborne Corps at Fort Bragg from June 1976 until his retirement from the Army on August 1, 1978. For conspicuous gallantry and intrepidity in action against an armed enemy while serving as a Prisoner of War in South Vietnam during August 1967. He distinguished himself by escaping from an enemy prisoner of war camp. Recognizing that odds for success were slight and if he were recaptured he would receive severe torture, long periods in solitary confinement, and possible death, he continued with his escape plan. The plan had to be carefully planned, memorized, and executed at the appropriate time. In August of 1967, Major Hardy successfully carried out his plan. The success of his escape was short lived and he was recaptured. Although he was recaptured, he maintained strong conviction and adherence to the Code of Conduct. The extreme gallantry exhibited by Major Hardy was aptly illustrated by the fact that so few prisoners ever tried to escape, primarily due to the rigid security measures employed by the enemy. His courageous and gallant escape served more than to merely get him out of the prison camp. More guards were required to try to stop Americans from escaping, enemy troops were diverted from battle duties to search for the escapees, and prisoner morale soared. By his heroic deed, Major Hardy demonstrated a great devotion to duty and country, disregarding concern for his own safety which demonstrated the highest traditions of military service.